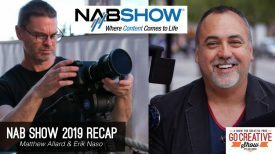 Everybody seems to be making LED lights theses days, and now Filmpower, who are best known for their gimbals, have become the latest company to enter this hotly contested market. 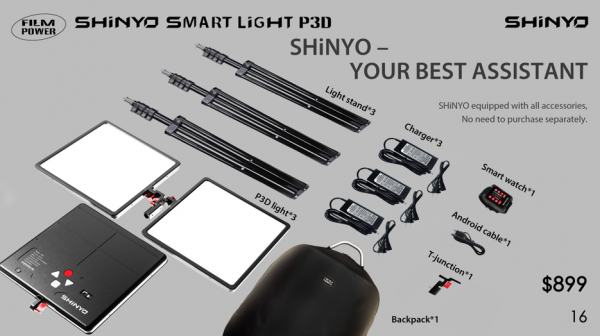 The Filmpower SHiNYO Smart Light P3D is being touted as an intelligent light with the form factor of an iPad, that can be control by an included Smart Watch. 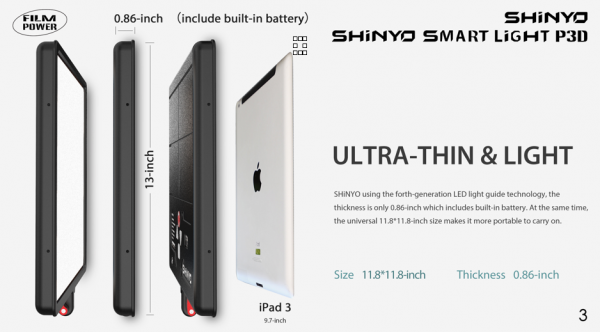 The SHiNYO P3D is only 22mm (0.86″) thick and has dimensions of 30cm x 30cm (11.8″ x 11.8″). The light weighs in at 2.2kg (4.8lb). It is color adjustable between 3300K-5600K and a claimed CRI of 96. The light is surrounded by an aluminium shell that Filmpower claims helps with heat dissipation and durability. On the back of the fixture is a OLED screen that shows you all the status information about the light. The buttons are also luminous so they can be seen in the dark. 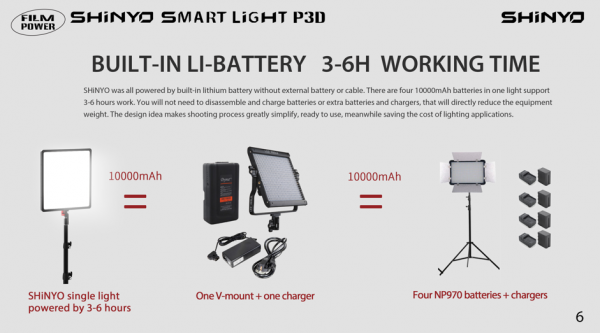 In some what of a strange decision for a portable light, the SHiNYO P3D uses a built-in lithium battery. 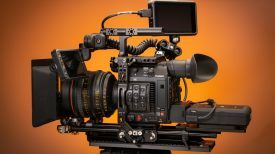 The built-in battery in the panel consists of 4 Li-batteries totalling 10,000 mAH, which Filmpower claims will give users 3-6 hours of continual run time. Not offering an external battery powering solution may well put some potential buyers off. 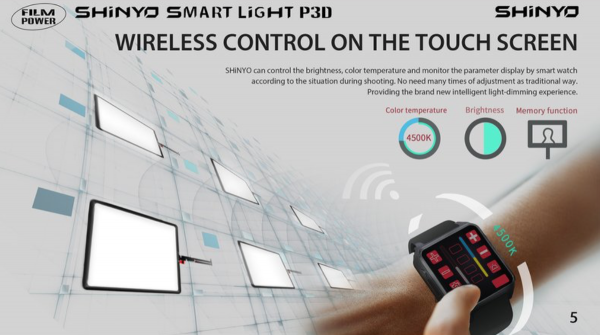 The SHiNYO P3D can be wirelessly controlled from the 1.5″ touchscreen on the included Smart Watch. On the watch you can control the lights brightness and color temperature. 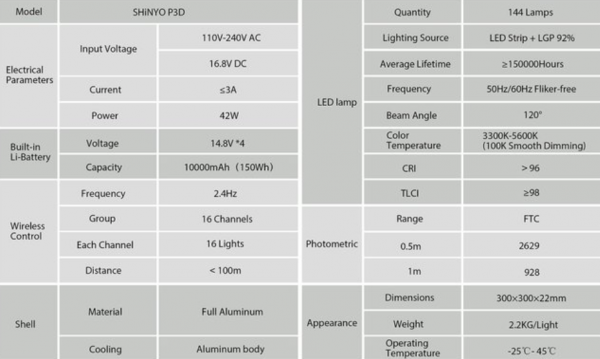 Through an intelligent control system up to 256 SHiNYO LED lights can be controlled at once by assigning them to 16 separate channels consisting of 6 lights in each channel. I’m not sure if anyone is going to use 256 of these lights at the same time, but I guess at least its reassuring that it is possible. The light can also be controlled via an App, but I believe that is only available on the Android store. 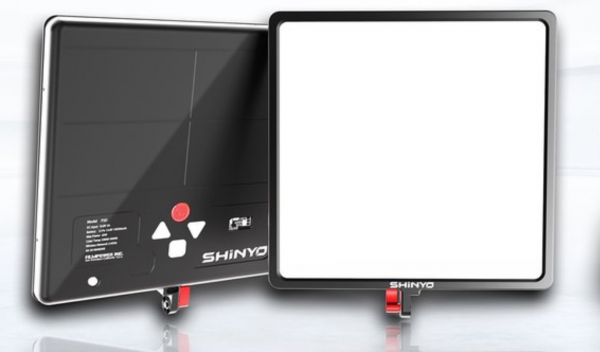 Filmpower claim the SHiNYO is using the latest forth-generation LED light guide technology, that keeps the output soft and uniform. The light is rated to last for a claimed 50,000 hours. In a nice touch two SHiNYO fixtures can be connected together so you can create different lighting angles. By adjusting the angle of both of the fixtures you can create three different lighting modes that Filmpower call balloon light mode, KINO mode, and Spotlight mode. SHiNYO P3D Kit is on pre-sale now for $899 USD, but it’s still unclear when the light will actually start shipping. Having not seen the light personally it’s hard to say just how well it performs. Filmpower claim the light has an output of 928fc (9990lx) at a distance of 1m, which sounds like a lot for a panel of this size, particularly one with a 120 degree beam angle. It’s certainly an interesting concept including a Smart Watch with a lighting fixture, but if the Smart Watch only controls Filmpower products and doesn’t do anything else I’m not sure how many people are going to use it. 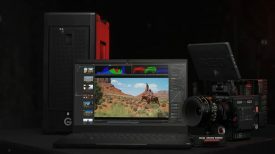 One thing is for sure, at $899 USD for a whole lighting kit it does look to offer very good value for money. 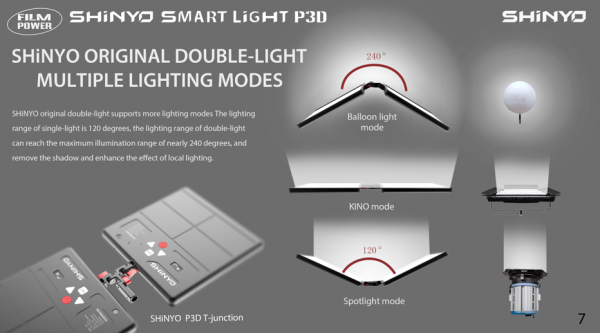 What do you think about the SHiNYO P3D? Would you buy one? Let us know in the comments section below.